After trekking through the jungle a few dozen kilometers, on the way to Son Doong Cave, one reaches the incredible Hang En Cave and its fantastic beach first, where trekkers camp. Considered the third largest cave in the world, the beach side of the chamber is over 120 meters tall and 140 meters across. The cave is so large that it has its own jungle, waters, beach, and climate. The main Son Doong Cave passage is the largest known cave passage in the world by volume – 38.4×106 cubic meters (1.36×109 cu ft). It is more than 5 kilometres (3.1 mi) long, 200 metres (660 ft) high and 150 metres (490 ft) wide and its cross-section is believed to be twice that of the next largest passage, in Deer Cave, Malaysia. The cave runs for approximately 9 kilometres (5.6 mi) and is punctuated by two large dolines, which are areas where the ceiling of the cave has collapsed. The dolines allow sunlight to enter sections of the cave, resulting in the growth of trees as well as other vegetation. The cave contains some of the tallest known stalagmites in the world, which are up to 70 m tall. As the biggest cave in the world, it is impossible to see Son Doong Cave entirely from one view. In fact, the cave is so large that it creates its own weather patterns and mist. Our porters volunteered to stand in as models in several pictures and hold fill lights to illuminate the massive walls and enveloping fog. For a better sense of how the cave layout, please refer to this map as well as National Geographic’s wonderful series of 360° panoramas taken inside and outside the cave. 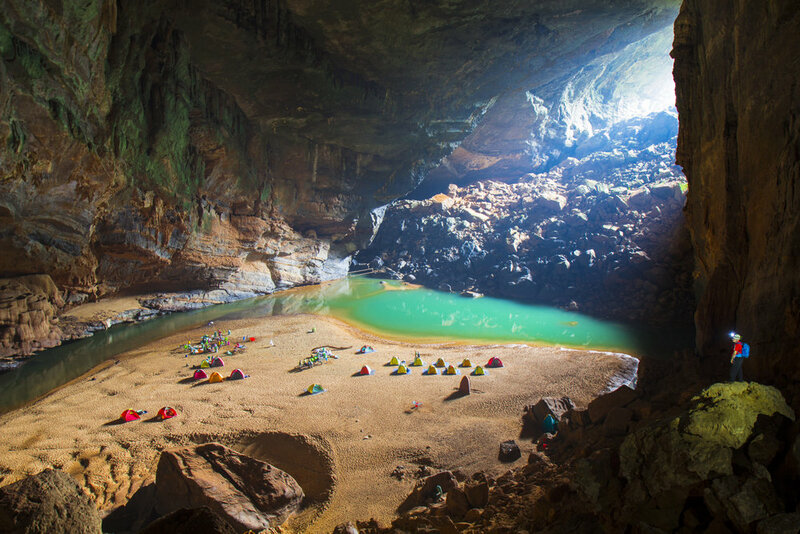 Paradise Cave, otherwise known as Thien Duong Cave, is a stunning show cave in Phong Nha-Ke Bang National Park, Vietnam. This park is the same one that contains Son Doong Cave (the largest in the world) and the beautiful Hang En Cave, both profiled above. The cave reaches an estimated 72 meters (240 feet) high and 150 meters (500 feet) wide. Approximately 31 kilometers of the cave has been explored but tourists are only allowed to visit the first kilometer. Regardless, the fantastic lights placed in this cave clearly illuminate the huge stalagmites and stalactites and bring out the fantastic natural purples and yellows that adorn the walls.